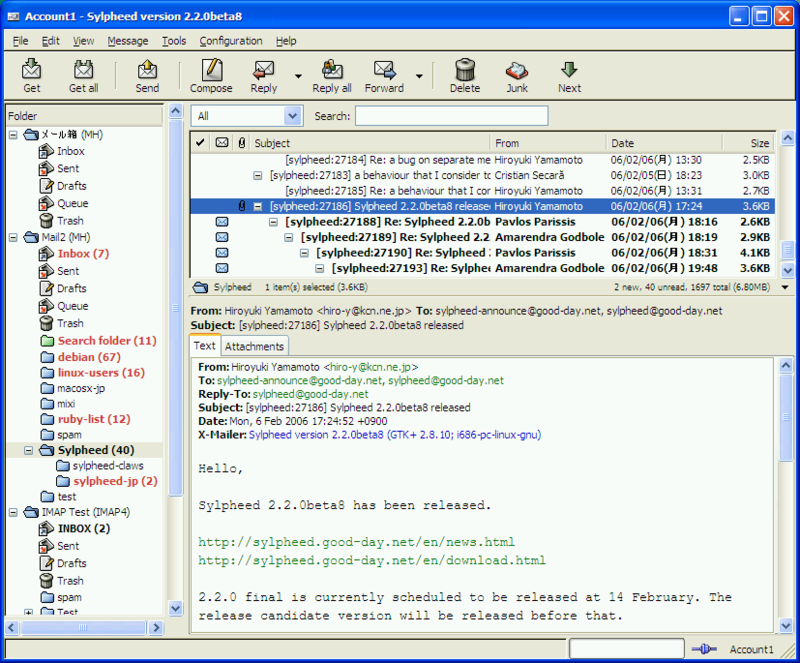 Sylpheed is a fast email and news client, with support for SMTP, POP3, IMAP4 and NNTP. It handles multiple mail accounts, threaded display, junk mail filtering, security (SSL/TLS), search, etc. Automatically displays mail in threaded (organized by subject) format and integrates easily with Gmail. Alternatively, X-Sylpheed and Sylpheed Portable are also available. @Kea: Thanks for the warning re. non-encrypted password storage. It's the same reason I ditched filezilla. Not encrypting one's account info is lame for otherwise well thought out software. @lux Maybe this was an earlier version? Now it stores all the data within the app folder, so portable. I recently moved away from Thundebird after 10 years use because everytime they update it, it breaks something or it runs slower. Slypheed is excellent. Its fast and reliable and doesn`t render html, which is exactly what I need. Thank you for the suggestion. I tested Foxmail 7, but didn't like the GUI, for me Foxmail 6 was better. More, many features that were available in Foxmail 6 have been removed in Foxmail 7. I can't find a mail client that I really like so I installed Thunderbird 2.0.0.24 again. Last time I used Sylpheed it didn't read HTML messages. Does anyone know whether this has changed or whether the developer of Sylpheed is planning HTML support? Sylpheed stores all your data in C:\Users\*nameuser*\AppData\Roaming\Sylpheed. Is there any difference between Sylpheed and Claws Mail? The password is indeed stored as plain text. As a workaround, remove password from the account settings and type when the application starts. Not too convenient if you have multiple accounts set up but it works. I use Sylpheed at home, with six accounts, and it works perfect. But I wouldn't dare to put it on my USB memory and use it away from home, since the passwords for all my accounts are in the ini-file without any encryption! Well.... I now use Thunderbird, it's leap and bounds ahead of Sylpheed. I would suggest everyone try out T-Bird and see if you agree. Has anyone successfully got gnupg working with sylpheed? Here's a trick: Download and install Sylpheed Portable (gpw.sf.net), then update Sylpheed to the latest version (3.03). Works great for me, I've been using it for almost a year with multiple accounts (ISP, Gmail, Hotmail, etc). Sylpheed seems to have at least one very serious bug. It doesn't work if I use a second account. It seems that Sylpheed applies wrong ports (995 instead of 110) and SSL although it is disabled at the second account. This is true for the Linux and the Windows version. And be careful with the "portable" version as said above. make a directory in install folder or somewhere else you want. In my case "data"
just right click sylpheed.exe and make a shortcut. In my case, it's ""D:\Program Files\Sylpheed\sylpheed.exe" --configdir .\data"
after all of this, all your mail data and configurations will be stored in this folder. This is BS ! every time I try to install this and run it it ALWAYS puts a folder in my Appadata\roaming folder. I've followed the directions, changed the .ini created a folder called 'Profile" the whole nine yards but still won't work as portable. When I do let it install the way it want's (with files in my appdata\roaming folder) It won't work if I move my thumb drive to another PC. This is very frustrating and I'm thinking of logging this software up as crap.... not portable. Well, the ini-file hint did the trick, and even though the app started out with a bad omen (appfreeze after 30mins), it now seems to run fast and reliable here. My first impression is that this is an interesting app, if you want a simple email-client which does the basics well. So, just a plain(-text) email-client without fancy stuff, which just works. If you remove unnecessary languages and UPX the binaries, you can get it down to about 6mb. Downsides? Well, the GUI in some aspects feels unnecessary unintuitive. One of many examples: The option to change which columns should be shown is very difficult to find. Another aspect is that it doesn't support all popular GUI-layouts (i for example would like to have a wide message pane, but thats currently not supported). So, if you can deal with a GUI, which feels a bit unpolished, and you are looking for a simple email-client which focusses on the basics, without any of that "modern" klimbim (not even html-messages)... then this email-client may be for you. ylpheed is installed and totally contained on my thumb drive. It works great but the problem is when I move my thumb drive to another PC (my laptop) Sylpheed won't work. In Claws Mail (similar to Sylpheed: http://www.clawsmail.org) change the property (or validate the current status) of the folder with a right click. The "Sent" folder should have the folder type "sent" under the "general" tab. Problem with Sylpheed is the same like other Unix ports: the complete GTK-Stuff under Libs/. But "man kann nicht alles haben". Works fine for me. How big are your sticks anyway? The smallest i have is 2GB. But anyway, the "just force a langauge on the user" thing is totally out of line. There are no Problems to use it portable! In the main folder ist a file named "sample-syplheed.ini". Rename this to "sylpheed.ini", open it an set the configdir-path to the folder you want to save the configuration files and the mailboxes. Concerning the Size. In the Folder "\lib\locale" there are folders of many needless languages. Delete the folders of the languages you don't need. I only need the "de"-Folder so i deleted all the other ones. Now the Sylpheed-Folder has a Size of 11,7 MB. this version doesn't support "maildirs" yet, so this software isn't actually portable - since mails/configs are saved under "c:\document and settings..."